Huzrul (‘Respected’) Ameer (‘Literally, a Prince, Noble’) Khoosroo (‘Emperor’) was a man of great and diversified talents. He lived during the reign of Ghyasadeen Bulbun who reigned from AD 1226 to 1236 and was born at Mominabad in the Province of Rohilcund and died at Dehlie AD 1325. He was a disciple of the celebrated Saint Nizamoodeen- Page 39- [f. 43v] grief for whose death is asserted to have been the cause of his own. Inscribed: naqsha-i dargah-i hazrat Amir Khusraw dar Nizam al-Din. His family are originally natives of Bulkh. his studies in medicine and other branches of service and literature to a perfection which entitled him to diplomas. Hence he came to Hindoostan during the reign of Sultan (‘Emperor’) Alaoodeen(‘Glory of the Faith’) Khiljie (‘name of tribe or family’), who reigned AD 1295 in quest of religious characters & on arrival at Dehlie became a disciple of Huzrut Sultan ool Mushayek Nizam Odeen Owleea (Page 40 [f. 43v]) under whom he practised so rigid a discipline as to induce his Master to nominate him to the succession of the Priesthood held by himself. He did not, however, survive to receive the honor having demised about AD 1325 two years previous to the death of the Saint. The Mausoleum and Mosque which are seen in the drawing were erected by his children. 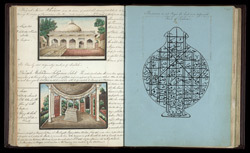 The same as at Page 3 [f.6] but in a different form of toghra [i.e. a vase shape].